The 70-piece set contains a T-Rex on a pedestal. The page linked to above goes on to say that "worldwide there are only 500 copies of this unique T. Rex box" so I think it's safe to assume that similar opportunities will be available in other countries in the future. Thanks to iefdb for the news. And there goes my desire to 100% complete the Jurassic World theme. This will be impossible to get, ah well, it was a nice dream while it lasted. I'm glad the color scheme on the other two T-rex figures look better or I would be really disappointed with this being an exclusive giveaway. I wish I was Belgian now. Noooooooooooooooooooooooooo this T-Rex is gonna be impossible to get ahold of! And i thought the 2010 Dinos were expensive! I'd say the set number is 4000031. T&C says you can only participate once per mail adress and you need an Xtracard (that's the Colruyt group's loyalty card scheme - Dreamland is part of that group). Edit: and only valid for in-store purchases. I really like the design of this T-Rex and I am not happy that it is going to be exclusive. I'm in New Zealand – there's almost no way that this will be available in any form here. Set number looks like 4000001, but thats already a set. I see why its an issue now theres a 3 or an 8 before the 1. I'm praying they make more than the 500. The leopard print looks so cool! Really nice looking T-Rex. Hope there's an equivalent promotion the UK. Getting so sick and tired of these limited exclusives, which are next to impossible to obtain. "It belong in a museum." Nice but I oh want: Carno, Stymoloch, Dilo and the JP sets. I'm guessing from the box art that the minifig with hologram doesn't come with the set? Which is too bad because the figure really helps complete the set and gives it some context. 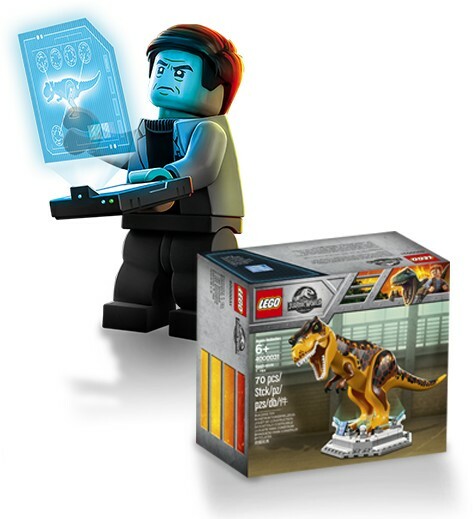 ^Yeah, it would be nice if that minifig with the holographic tile and tablet was in the set. Still want to hunt this down. Where is this store? I think the set number is 4000021. In double checking, the number seems to be missing from the complete list of sets. The tablet part is in the set as you can see it on top of the box. It looks like there‘s two of them on the front and back of the podestal. It's at Lekia in Sweden too. things I like rather than collecting. Is this store in the uk? ^*, 4000021 was my best guess too but it's a bit of an odd place to put it given what others in that number range are. I despise exclusives containing unique figures. This is such a stupid practice for so many reasons. I really hate exclusive sets. You know they always end up in the hands of people who wanna make money of them. So expect these sets to show up on E-bay soon. When will Lego learn that they're really shooting themselves in the foot with these impossible-to-get exclusives? Sure, they'd attract 100/200/500 fans who gets riled up about getting a unique set, but if they're at the same time losing 100k potential completists who drops out from the theme, then what's the point? Dreamland is a chain of stores located in Belgium ( more then 40 in Belgium and 2 stores In France), known for their low prices in toys. Will be interesting to see how these are dolled out in the US. Will LEGO B&M stores sell Jurassic world sets with a scratch card or something? Actually the more I think about it the more I dread that LEGO is making this a CC exclusive, sadly. I will never understand the completionist “If it exists, I must have it/if I can’t have it, it shouldn’t exist” attitude. It’s so entitled and so juvenile and smacks a little of privilege. Sometimes in life you’re going to want things you can’t have, and that’s not the fault of those things for existing. This isn’t even something I can understand people being upset about like a minifigure of a character who hasn’t been released elsewhere — it’s just another perfectly meaningless pattern on top of the several the T-Rex is already available with! Maybe you can’t have a complete collection of Fallen Kingdom sets. But ya know? Nobody who matters is ever going to judge you for that. And if having a complete collection of SOMETHING is so utterly essential to enjoying your hobby, you can just strive for a complete collection of something more achievable, like all RETAIL Fallen Kingdom sets. See how easy it is to actually control your own goals and satisfaction with those goals instead of giving up control of your emotional state to forces utterly outside your control? If you work at it, you might even get to a point where you have a healthy enough worldview to realize how cool it is that LEGO sometimes makes special things for lucky people even when you’re not one of those people. I know I’ll probably never own a solid gold Bionicle mask, but that doesn’t mean it’s not super cool to me that LEGO made several of them as contest/sweepstakes prizes! Nobody would be better off if cool prizes like that didn’t exist. @Aanchir This limited edition practice should be stopped. End of.